Check out our Ice Skating Parties-available YEAR ROUND! YOU BRING THE GUESTS, WE'LL DO THE REST! Our professional staff is on hand to assist you with all of your party needs! With our beautiful, large outdoor pool area, we can safely state that we can handle a minimum of ten, and up to any number you desire. Our three heated pool options will have your guests smiling and splashing in no time! The main Pool is fifty meters long by 25 yards wide and only 3 1/2 feet deep. Our Diving Pool features 2 one meter diving boards with a pool depth of thirteen feet. Our Kiddy Splash Pool has interactive water toys and depth goes from six inches to 11/2 feet. Try to arrive 10 minutes prior to scheduled party time and wait in lobby area as a group. You can not get into the pools until a party hostess has registered each child! Food will be served at the time you choose. Pitchers of soda are based on the number of children attending. Additional pitchers may be purchased at $5.00 per pitcher. All guests will receive either 1 slice of pizza, 1 hot dog, 11 order of chicken fingers, or 1 order of chicken nuggets and a bag of chips. Balloons, paper goods and candles are supplied. Additional food may be purchased from the TIME-OUT CAFE. 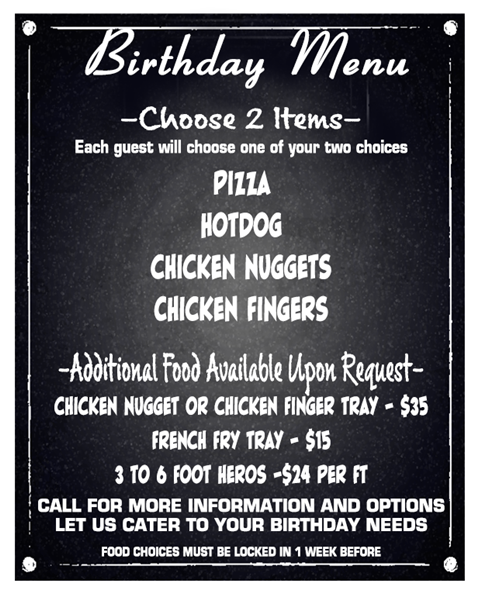 If you are interested in ordering extra food for the Adults or Children, make sure to mention this when booking the party. Please do not bring any food in from the outside, with exception of a cake. A FREE Skating Pass for a future visit will be issued to the birthday child. As a party favor, each child attending will also be presented with a FREE Skating Pass for a future visit. These favors, valuing at a minimum of $120.00, are included in your party package! Parties are held Monday through Friday between 4:30 p.m. and 6:30 p.m., and 12:00 p.m. or 3:00 p.m., Saturday and Sunday. In keeping within the two-hour time slot, we ask that you follow the above schedule. Price for the birthday party is $240.00 for the first 10 children (minimum) and $19.00 for each additional child. Final payment may be cash or credit card (Discover, Visa, Master Card and American Express). A $50.00 NON-Refundable deposit is required. The Renter is responsible for any damages occurring during the event. All applications are contingent upon availability of space and staff. Use is restricted to area by the pool designated by the Pool Manager or Head Lifeguard. All present must vacate the pool and area if Pool Staff deems it necessary for the safety of Patrons. Minors must be supervised at all times, compliance with park and pool rules will be expected by all in attendance. Applicant is responsible for all personal property.